The Powder Forest Homes is a 55+ community in Simsbury, Connecticut. This active adult neighborhood will consist of just 182 single-family homes at completion that will be sprawled across 107 acres within a serene and natural setting. This small, close-knit environment allows neighbors to mingle and build lifelong friendships. Residents will also enjoy a low-maintenance lifestyle thanks to an established homeowners' association (HOA). The community's well-appointed amenities will also provide a great place for residents to relax, socialize, and have fun without traveling far from home. At the center of this active adult community is The Meeting House. This 3,500 square-foot clubhouse provides all of the recreational and physical activities residents could want or need. Homeowners can maintain a fitness regimen by using the exercise room. A conference room and media room are perfect for hosting a club meeting or event. The catering kitchen is convenient when preparing snacks to take to a party. Bookworms can have a quiet place to catch up on the latest novel in the library. Neighbors enjoy socializing and playing games in the card room or billiards room. Homeowners also have access to a wine cellar where they can store their own bottles in individual bins. Outdoors, residents take leisurely strolls along the neighborhood's walking and biking trails. They can also get some fresh air while spending time on the outdoor patio or have a picnic in one of the parks and natural spaces in the community. Ensign-Bickford Realty Co. began construction of The Powder Forest Homes in 2006 and plans to offer 182 single-family homes upon completion. Active adult homebuyers can choose from a variety of distinct floor plans that range in size from approximately 1,542 to 3,457 square feet. They have two or three bedrooms, two or three bathrooms, and an attached two-car garage. These detached homes feature classic colonial exteriors, energy-efficient designs, open layouts, hardwood floors, large master suites, eat-in kitchens, stainless steel appliances, and private decks. This age-restricted community provides residents with a low-maintenance lifestyle. A monthly HOA fee covers snow and trash removal, landscaping, clubhouse maintenance, and insurance. Thanks to the HOA taking care of exterior home maintenance, active adults have more time to pursue hobbies and other interests. They can socialize with friends at the clubhouse or start a new club. Activities like cards, games, bridge, and billiards are just some of the recreational options homeowners have while living in this vibrant and welcoming neighborhood. Ideally situated in Simsbury, CT, residents enjoy a tranquil and picturesque environment. There are twelve municipal parks and four state parks that provide plenty of green and natural spaces for hiking, camping, and fishing. The 26-mile Farmington Valley Greenway runs along the Farmington River that provides beautiful trails for scenic bike rides. Golfers will love having Hop Meadow Country Club just five minutes away or the Blue Fox Run Golf Course nine minutes away for their next game. In addition to all of the wonderful outdoor recreation, residents are also close to daily conveniences like a pharmacy, grocery store, bank, restaurants, and retail shops. Getting around town is easy with access to Route 202 and 44 nearby. When traveling farther is necessary, Bradley International Airport is 25 minutes away. For big-city entertainment and attractions, homeowners can reach Hartford in 26 minutes. 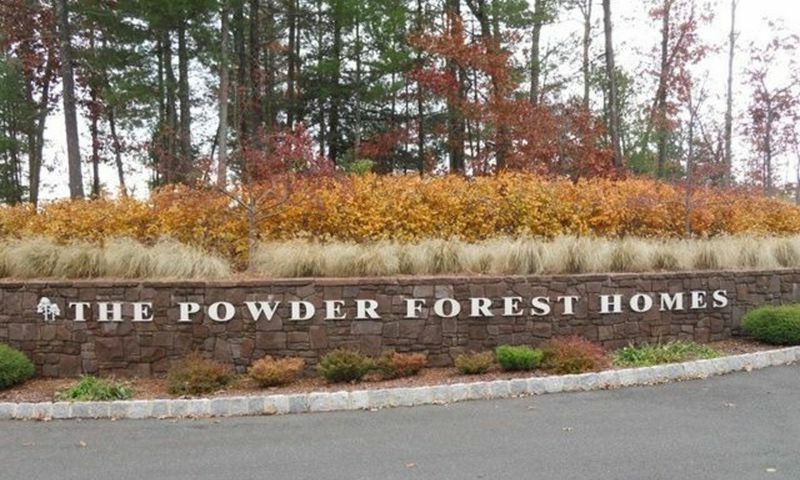 The Powder Forest Homes is a beautiful 55+ community that provides the low-maintenance homes and amenities active adult homebuyers seek in Central Connecticut. The Meeting House - 3,500 Sq. Ft. There are plenty of activities available in The Powder Forest Homes. Here is a sample of some of the clubs, activities and classes offered here. Ensign-Bickford Realty Co. began construction of The Powder Forest Homes in 2006 and plans to offer 182 single-family homes upon completion. Active adult homebuyers can choose from a variety of distinct floor plans that range in size from approximately 1,542 to 3,457 square feet. They have two or three bedrooms, two or three bathrooms, and an attached two-car garage. These detached homes feature classic colonial exteriors, energy-efficient designs, open layouts, hardwood floors, large master suites, eat-in kitchens, stainless steel appliances, and private decks. Please Note: Floor plans are not available at this time. 55places.com is not affiliated with the developer(s) or homeowners association of The Powder Forest Homes. The information you submit is distributed to a 55places.com Partner Agent, who is a licensed real estate agent. The information regarding The Powder Forest Homes has not been verified or approved by the developer or homeowners association. Please verify all information prior to purchasing. 55places.com is not responsible for any errors regarding the information displayed on this website.